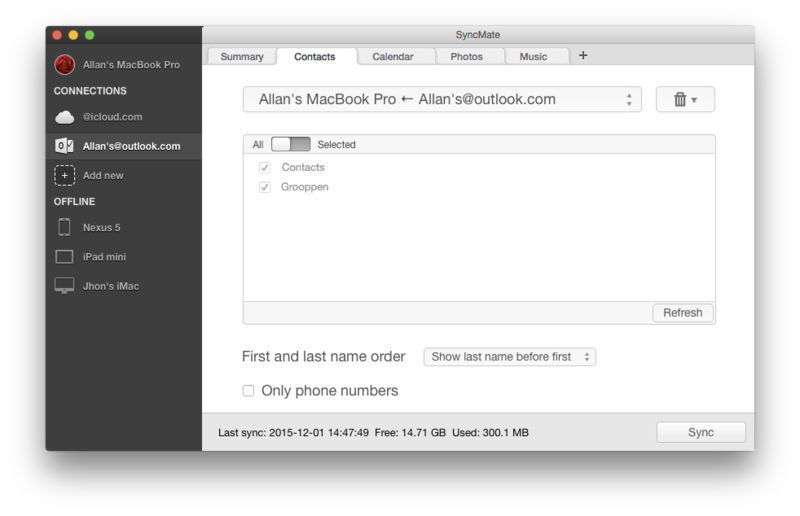 Can I sync Outlook Contacts with Mac? There's a little secret to buying an Apple computer, one that you may not learn until it's too late: Apple actually wants you to use exclusively their own services, not any similar programs developed by third parties. Sure, there are Google and other online services that enable data access via web interface. However using them is not always convenient and reliable. Synchronizing Outlook and Mac is quite straightforward, difficulties arise when we talk about automatic synchronization - simply because there is no such thing. This is when you need SyncMate, it allows synchronizing not only Address Book, but also other vital data in your Outlook online account. You need to setup SyncMate just once and all further syncing sessions happen in the background, you do not even need to be in the picture! SyncMate is a universal solution for syncing Mac with various devices and online accounts. You can easily synchronize any data with your online online storage accounts, MTP, Mounted, Android and iOS devices, as well as Microsoft services. 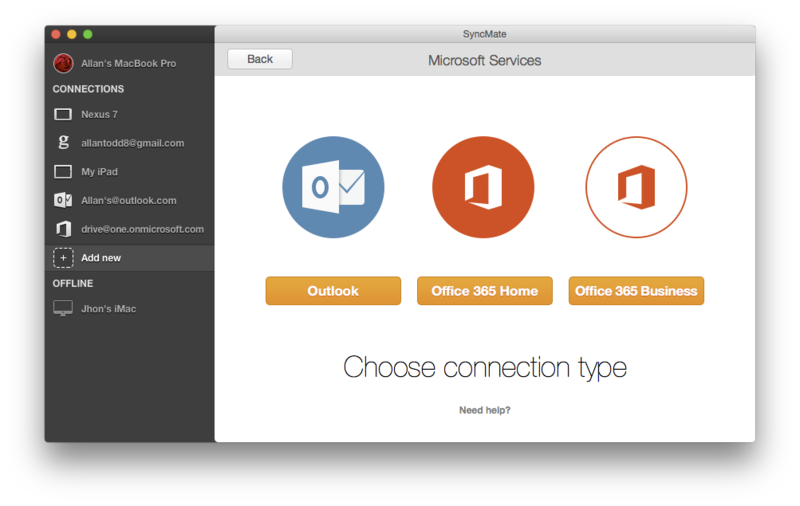 Due to macOS limitations SyncMate only syncs with online Outlook accounts; sync with desktop Outlook app for Mac is not supported at this time. We strongly recommend you to do a backup before your first synchronization. Download and install SyncMate on your Mac. Once the installation is complete, launch the application. In the main window displayed in the left pane click ‘Add New’ link. Wizard will assist you, make sure to click Microsoft Services button to choose Outlook. Log in using your credentials. SyncMate provides flexible settings for synchronization. Thanks to autosync, backup and other useful options all the data you need is always up to date. 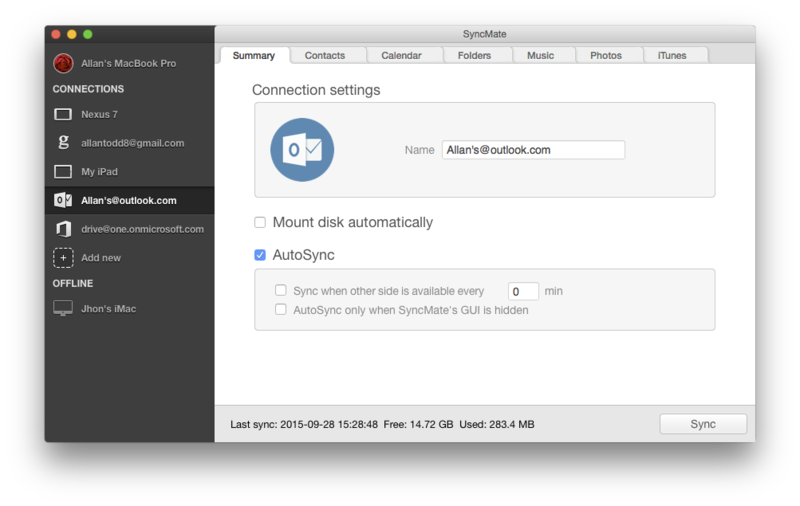 Q: Why should I sync data from Mac OS X? A: Because you want all your devices to be up to date regarding any personal or business information. And rather than just doing it manually across all your devices, you can use SyncMate to keep everything up to date between all your account or devices. It’s a time-saving software that will make syncing data a walk in the park. Q: Is there a difference between data transfer and Mac data synchronization? A: There is a difference between the two operations, yes. While data transfer only refers to moving data from one place to another and from one device to another, the synchronization process allows you to equally update each device with the same amount of information and organisation of files, contacts, notes and media files. So it’s like cloning your Mac on your smartphone. Q: With how many account or devices can I use SyncMate with? A:You can use SyncMate with as many devices and accounts as you see fit. There is no limitation in place when it comes to syncing Mac OS X through this iOS sync Mac tool. It gives you the possibility of having the same data and information and all your devices, Android or iOS. Q: Can I also use SyncMate without an Internet connection? A: The app enables you to synchronize Mac with other accounts and devices over several means of communication. You can use Wi-Fi while online or Bluetooth and USB when offline. SyncMate is the only tool which has its own built-in Sync Service that allows data transfer between Mac and other supported devices/accounts. SyncMate combines two features in one app - Mac data synchronization and Mac data transfer (each device can be mounted as a Mac OS X disk and data can be transferred directly between macOS and the respective device). You can be sure that your data is safe while syncing is performed since the process takes place directly between Mac and the connected device or account, no other third-party storages involved. Data is synced directly between apps on both devices - contacts between address books, photos between galleries, etc. SyncMate is the only app that combines such a wide functionality and flexibility. You do not need to download and use several apps to sync each device or account with your Mac - SyncMate will sync all of them with your Mac OS X. Moreover, SyncMate allows syncing any, we mean ANY type of data between macOS and supported devices/accounts.